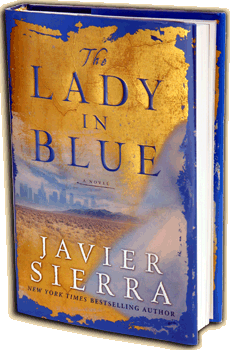 An intriguing blend of spellbinding action, modern metaphysics, and ancient religion and faith, The Lady in Blue explores the trances and bilocation (the power of beign in two places at once) of María Jesús de Ágreda, a seventeenth century nun from Spain, who was accused by the Inquisition of travelling a distance of 6,000 miles more than 500 times to the New Mexican territories to propagate the word of God –without ever leaving her monastery. In modern-day Europe and America, this ancient mystery awakes the interest of a journalist, a retired psychic spy burned out from her job with the U.S. Defense Department, and several priests. True-to-life, the Vatican and the U.S. Defense Department are involved in researching synchronized music to induce time travel. They believe that uncovering the secret behind The Lady in Blue’s bilocations will get them closer to their goal, so when one of the priests suddenly dies and a rare manuscript containing the nun’s secrets is stolen, a race against time begins. You can´t miss this surprising novel! It has all those ingredients that make the page-turner genre so much fun.